Over the course of the month, the 2009’s have started hitting the shelves across the city. With hot, dry weather throughout the growing season, this vintage has been receiving great reviews. Willow Park Wines brought the 09’s out last night (see the shot on the left) and offered customers a chance to taste a nice line up of them at their annual Bordeaux launch and sale. It was a great opportunity to taste these much anticipated wines and get an overall impression of the vintage. Before getting into that, first a bit of background: as mentioned in this week’s blog post, red Bordeaux is a blend of several grape varieties with either Cabernet Sauvignon or Merlot forming the majority of the blend. The tricky part is that the label won’t tell you what grape variety makes up the majority of the blend. You can generally tell though by the part of Bordeaux that the wine is from: if the label indicates that the wine is from St. Emilion or Pomerol, Merlot will generally make up most of the blend. Cabernet Sauvignon dominates in a larger list of areas, including Margaux, Pauillac, St. Estephe, St. Julien, Pessac-Leognan, and Graves, so look for those names on the label if you’re looking for wines where Cabernet Sauvignon makes up most of the blend. Why go into this detail? While tasting last night, there was a pronounced difference between the wines in which Merlot vs. Cabernet Sauvignon dominates. Starting with St. Emilion and Pomerol, opinions are going to be divided on these wines. Due to the predominance of Merlot, combined with the hot weather, these wines are soft, fruit forward, with lots of black cherry and plum flavours, and almost a sense of sweetness to them. For those who prefer this ripe, upfront style of wine, 2009 St. Emillion and Pomerol will be a delight. Others though, will find that these wines lack a certain degree of vibrancy and structure. For them, wines in which Cabernet Sauvignon dominates will be what they’re looking for. These offer typical blackcurrant and red cherry flavours with more acidity and tannins to provide that sense of vibrancy and balance. If you wanted to pick up a few bottles, the 2009 Chateau La Garde stood out for me. It offers blackcurrant and black cherry fruit, combined with cedar, tobacco, and mint. It showed good acidity and ripe tannins to balance it out, so overall provides everything I would look for in a good Bordeaux. Its price tag is well below the price of most bottles being tasted last night at $34.99 per bottle (on sale for $29.99 until Sunday night). It can be drunk now (with some serious decanting), but I would put it down for at least a few years and if you’re up for it, it will be great to drink any time over the next decade. Also last night, Willow Park published their first list of 2011 Bordeaux futures. 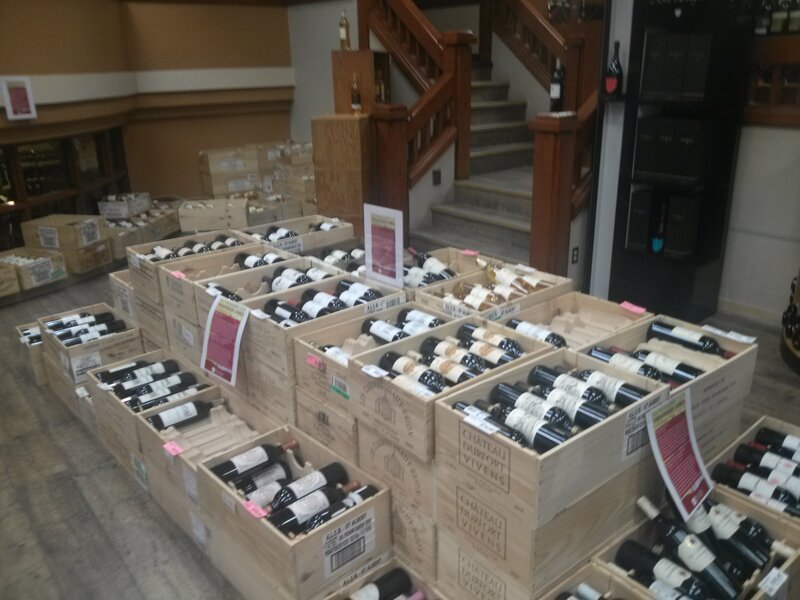 These are wines that are still in barrel at the Chateaux, but can be purchased in advance, generally at lower prices compared to once these reach the store (in 2014). 2011 was a much more challenging vintage than 2009 (and 2010). Summer showed up in Spring with hot, near-drought conditions, followed by Spring showing up in Summer with mild and wet conditions, leading to small crops and variable quality. The silver lining is that prices have come down somewhat compared to 2010, although the question is if they will be coming down enough for buyers to pick up a lesser vintage after two great vintages in a row. First and foremost, you’ll be paying for wines now that you won’t be able to hold in your hands until at least two years from now. If you put in an order, it doesn’t mean that your entire order will be available. Each store only receives a certain allocation of each wine, so your store will let you know if your entire order is still available when they process it. Willow Park’s 2011 futures offer can be found at http://www.bordeauxforsale.com/. If you wanted to pick up one wine, I would recommend the 2011 Chateau Lilian Ladouys. This wine has been getting great reviews across multiple publications over the past several years, but I had never been able to find it in Calgary. So I was quite excited to see it suddenly show up on the list last night. According to Decanter (who tasted the wine from barrel), it shows a “floral cassis nose, good middle fruit and quite a supple finish.”. Yum.